«Berkeley Eastman is well-known for the mini tugboat plans and houseboat plans he designed and built. In 1986 Berkeley Eastman designed his first set of mini tugboat plans, which later became the Candu E-Z, our 14'3" mini tugboat. He began with a radio controlled scale model. It looked so great that he built the first full-sized boat. After designing the Candu E-Z, he follwed with the other 3 mini tugboats, the Micro-Tug 9, which is 9' in length, the Perfect 10, which is 10' long, and the Candu Junior, which is 11' in length. Berkely Eastman's love of houseboats brought him back to the drawing board a short time later. He drew houseboat plans beginning with the Aqua Casa 16'. He then followed with the Aqua Casa 20' and the Cape Codder, which comes either 20' or 24'. The Aqua Casas are fully trailerable and their use doubles as an RV! Berkeley had the plans drawn for each of his boats, built a prototype, and then the mini tugboat plans and the houseboat plans were done professionally by Computer Aided Drafting. The plans were drawn by David Cronk, of Fallbrook, CA. He is a genius on the computer, and it is due to him that when you order from our site, you recieve completely engineered and easy to understand instructions and plans. Our plans still bear Dave's name at the bottom of each of the CAD pages. He was a close friend, neighbor and confidant of Berk's for many, many years. Here is a quote from Dave: "Berk and I spent 100's of hours together (many late nights) hashing out design and engineering details. It was pretty funny in the beginning when Berk didn't believe a computer would be of any help in design and layout work. We designed and modeled the first tug in 3-D CAD. I was then able to "un-wrap" the individual components and make them into flat patterns. On just one component, this could save days of tedious work trying to figure things out by trial and error. Berk became a believer overnight and did very little by trial and error after that. We had fun times together." The plans for these boats are simple to read and understand, making it possible for someone with very little experience to build and complete their own boat! The materials and supplies are almost all available at your local hardware or lumber store, and the boats can be built with simple tools that you already have around the house! For the few materials needed to build you mini tugboat or houseboat that cannot be purchased at your hardware store Berkeley Engineering has included a list of suppliers, complete with contact information. 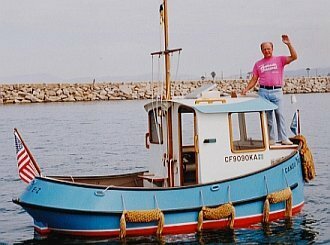 «Berkeley Eastman passed away in November, 2006, shortly before turning age 81, but his business of selling the mini tugboat plans and houseboat plans for the boats that he designed and loved continues on today through his family!